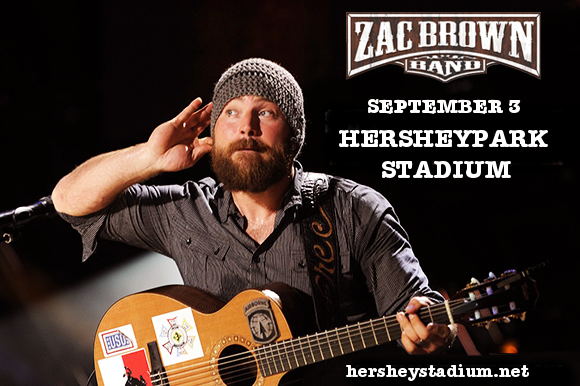 Heads up, country-folk lovers; Hersheypark Stadium announces Zac Brown Band on Sunday 3rd September 2017!! Limited tickets still available but selling out FAST – get yours while you still can!!! Hailing from Atlanta, Georgia, the Zac Brown band were formed in 2002 by an extensive lineup of talented multi-instrumentalists including frontman Zachry Alexander "Zac" Brown, Jimmy De Martini, John Driskell Hopkins, Coy Bowles , Chris Fryar, Clay Cook, Matt Mangano, and Daniel de los Reyes. Their first major-label album, “The Foundation,” was a massive critical and commercial success, winning Grammy Awards for Best Country album AND Best New Artist!! The album has since been platinum-certified, having now sold over 3.4 million copies in the US. Throughout the course of their career, which saw them release 6 full-length studio albums in addition to two live albums and one greatest-hits, they have charted 16 times on the Billboard Hot Country charts, with 11 singles, including classics such as "Chicken Fried," "Toes," and "Highway 20 Ride," reaching the number one spot!! The band have gone on to collaborate with massive names including Alan Jackson, Jimmy Buffett, Amos Lee, String Cheese Incident, Trombone Shorty, Jason Mraz, Dave Grohl, and Chris Cornell to name a few!! The band are now going on tour in support of their brand new, soon-to-be released album, “Welcome Home,” ready for release in May!! Listen to the new single “My Old Man,” below and get your tickets quickly to be among the first to hear all the brand new material LIVE! !